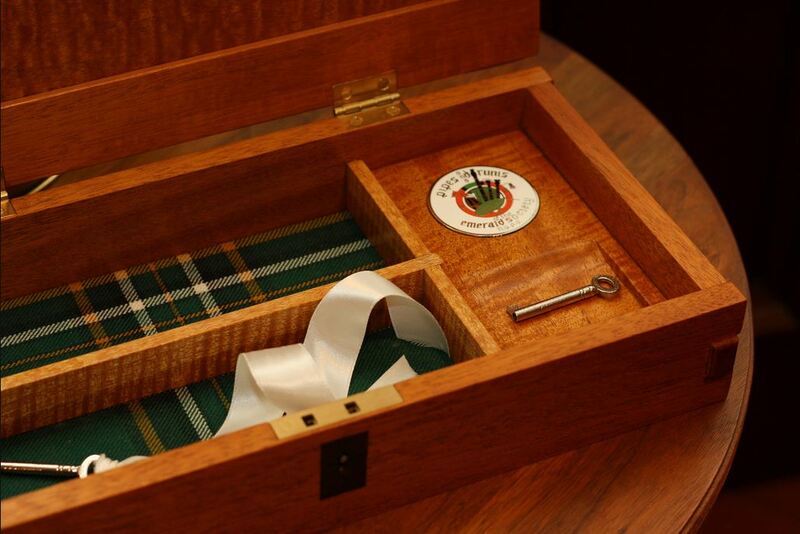 Last month, I finally finished the sgian dubh presentation box for Bill, a member of the NYPD Pipe and Drum band. 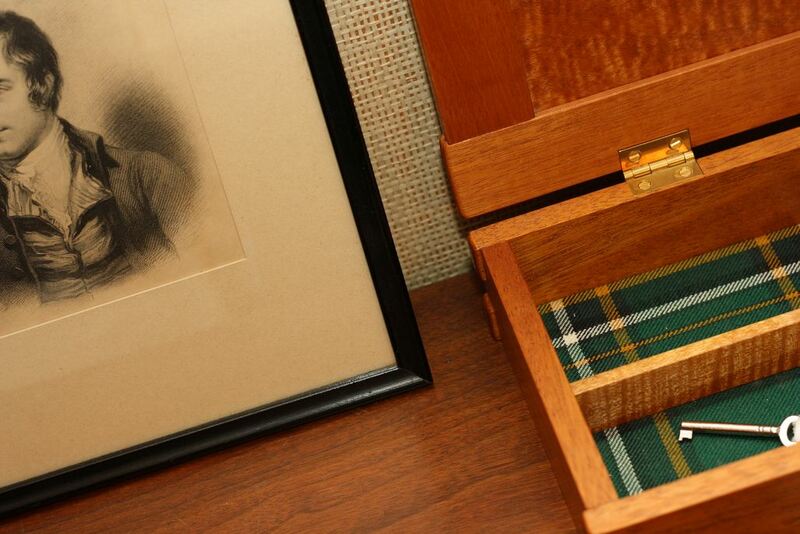 The box, along with a pair of Rab Gordon sgian dubhs, was commissioned by Bill’s (great) friend, Don. When I first received the request from Don, he indicated several details he wanted me to work into it, if at all possible. I told him I would see what I could do, but that I really worked better when I was given a certain amount of creative freedom. I also explained that it would be a design challenge to put so many details on the box without detracting from the overall appearance of it. (See? I can be diplomatic when I need to be.) Finally, I told him what kinds of costs were associated with my boxes, which can be a bit high as I use the best hardware I can get my hands on. I’m not going to spend 20 hours making a box and put some cheap $2 pressed hinges on it. Materials: Mahogany, Curly Mahogany panel, Bog Oak escutcheon, Irish National tartan lining, Brusso brass hinges, English half mortise box lock from Whitechapel Ltd.
Let’s get the cons out of the way first, shall we? For starters, I took way too long with this project. That was due to many factors, including raising a one-year-old-turned-two-year-old, a complete wreck of a workshop, and challenges with working out a new box design. I did way too much sanding with this project. That mostly had to do with rounding the proud box and bridle joinery. I like the photos of the box in its “natural” habitat, but I probably should have taken some proper pictures of it, as well, with the multi-angled lighting and the backdrop and what have you. Finally, there were a few construction issues I had, like when I accidentally rounded the wrong edges on the lid frame when it was disassembled. In order to fix it, I had to plane it a bit and that made the bridle joints uneven. I also had a few joints that were not quite as tight as I wanted them to be. What bugged me most of all about the joinery, though, was that I used the table saw to cut it all. The joinery on the next box will be done with hand tools, for better or for worse. This box is by far the most elegant of the boxes I’ve made so far. I was very happy with the end result of the exposed box and bridle joints and the box dimensions. I will definitely make some boxes in the future that use this technique. 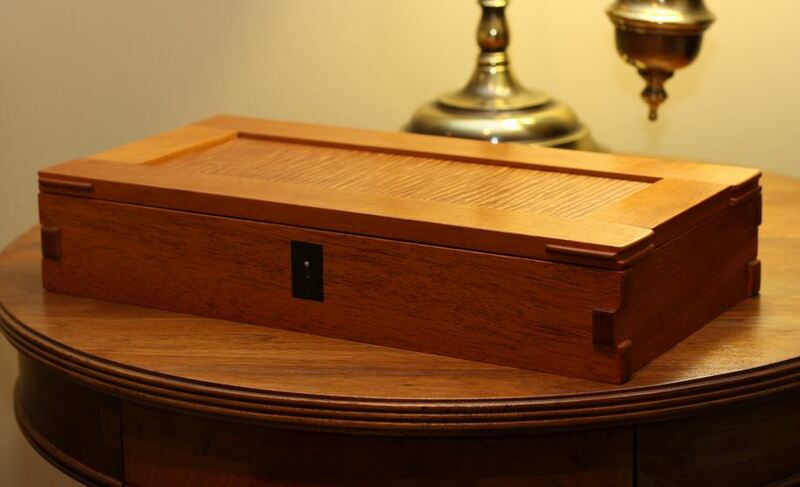 I loved the combination of mahogany and curly mahogany with the little splash of bog oak. I want to start doing more with my bog oak escutcheons, though. I have some ideas jotted down – I just need to start putting them into the projects. That half mortise lock installation was tight! I love it when I end up with nice crisp lines and a well-fitted lock. Overall, I’m very happy with this box. My wife told me this was her favourite box so far, as well. I’ll have to keep that in mind when I start working on a box for her. The box looks great. I like your choice of materials and hardware and I think you did a fine job and I’m sure Don and Bill will agree. Thank you for sharing the story, project, and your notes. 5. The lower edges of the box joints are eased. I think I would experiment with easing the bottom edges of the box the same amount. I hope you find some of my comments helpful. Thank you for the comments! I miss my peer review sessions I had with all of my studio classes in college. They were so helpful for development and it’s hard to find that kind of atmosphere outside a scholastic environment. 1. I was cheating there and using my fixed 50mm lens to do inside shots without setting up other light sources. The only real drawback to my 50mm lens is the incredibly shallow depth of field. I agree, I should have changed lenses and done some shots with a backdrop and lights down in the workroom. 2. I’m not looking for speed, regarding the use of power tools vs. hand tools. I’m looking to reduce my dependence on power tools. The main reason the box took so long didn’t have as much to do with the actual construction so much as it did a) finding time to get in the workshop and b) wasting time working out design issues (I remade the lid twice). Maybe I should invest in a jointmaker pro. 🙂 Joinery cut by hand WITH speed and precision. 3. That is one option to review again. I actually did mock-ups of the joinery both ways in poplar (again, this also added to the time factor) and was happier with the single pin on the front, mostly because I wanted the box joints to mimic the bridle joints and the bridle joint looked terrible the other way. Another option I was thinking of would be to do more with the escutcheon. I have been looking back to some of the Greene and Greene designs and using some of their escutcheons for inspiration in some sketches. There are several that I like and feel would add value to the overall design, so I’ll start playing around with some scrap wood and see if I can come up with something pleasing. 4. Meh. I was distracted when I wrote that bit down, and not using my notes, which were at home in the shop. The interior length was 9″, so the total length is really 10″ (per 1/2″ thick stock). I thought I remembered the interior width at 6″, so the actual width is closer to 7″. But that doesn’t seem right, for some reason. And the height doesn’t seem right, either. I have it in my notes somewhere… I’ll have to dig that up. 5. Yep, I know what you’re talking about. I didn’t notice it stood out like that until after I was taking the picture of the joinery (I assume that is where you saw this). I think you’re right – easing the bottom edges would soften it up just a little and give it a little more harmony with the joinery. Again, thanks for taking the time to offer your advice, Chris! It is most sincerely appreciated! I watched the video about the Jointmaker Pro, and besides being a MAJOR investment I am hesitant to call it a “hand tool”. It’s a hybrid, not too far from attaching a hand crank to the arbor of a small table saw. All the skills and muscle memory associated with cutting with back saws and dovetail saws are no longer necessary. I’m not so concerned about whether or not I can call it a hand tool. For me, it is about not having a lot of airborne dust, being safe, and being quiet. So if it meets those requirements, I’ll consider putting it in my shop. Of course, I’ve done pretty good so far without it. But I’d like to play with one for a few hours and see how it feels before I totally discount it. It is 14″ x 7″ x 2.75″. I just measured the mock-up box I made in poplar to the same dimensions. Obviously, my memory is poor. Simply beautiful. 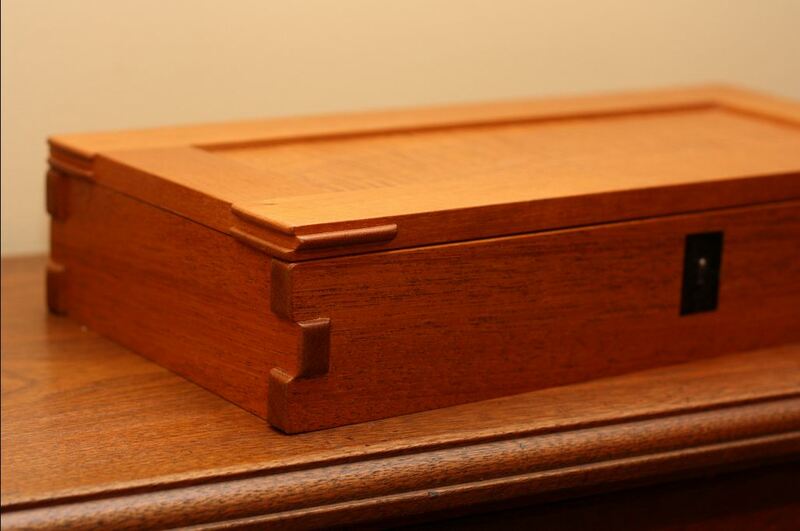 I was struck immediately by the box joints and the bridle joints on the lid. The combinations of wood are perfect. I respect your humility in taking the time to critique your own work. We tend to be far more critical of ourselves than others are of us. Beauty is in the imperfections. The Japanese have a term for that: Wabi-sabi. I don’t mind making mistakes (though I like them less when I make them on a commissioned box); I’ve learned a lot from most of them. The first time I made an inlaid escutcheon was because I buggered up the keyhole and had to fix it. I loved the end result, so now I do them when I can. Offering good constructive criticism, both to yourself and to others, is not easy. It is easy to be critical of something; the challenge is in presenting it in such a way that the other person (or your ego) doesn’t shut you out because they feel affronted. I’m grateful for the studio art classes I took in college, because they taught me how to offer up good constructive criticism. More importantly, they taught me how to receive it, as well. It comes in handy with both my day job (technical writer) and my woodworking hobby. It was a real pleasure collaborating on this Sgian Dubh and Presentation Box project. Thanks, Rab! Always a pleasure to make a box for one (or two) of your sgian dubhs. I love raising the bar on myself, too. 🙂 Can’t wait to see what the next one looks like!